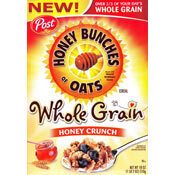 The complete name of this cereal is Honey Crunch Honey Bunches of Oats Whole Grain. That's a mouthful in itself. 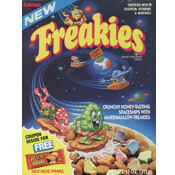 Surprisingly, the box doesn't indicate that there's clusters in the cereal. That's a mistake. There are clusters and they are the best part of this cereal. They're large, crunchy and quite sweet. In contrast, the flakes have more of a Wheaties-like whole wheat flavor - although these flakes are larger and crunchier than Wheaties. It's the contest between the indulgent clusters and the healthy taste of the flakes that I found interesting. There's nothing really new happening here in terms of flavor. This new cereal reminded me a lot of original Honey Roasted Honey Bunches of Oats but with more crunch and a bit more complexity in texture. Lucky for this cereal, I love the original Honey Bunches of Oats, so I'm going to rate this one quite high. In a head-to-head battle, I prefer the lighter distinctly Honey Bunches of Oats flakes in the original cereal. But I believe there are many who will prefer the heartier, crunchier texture of this new cereal. If the price is right, I recommend that you give this one a try. 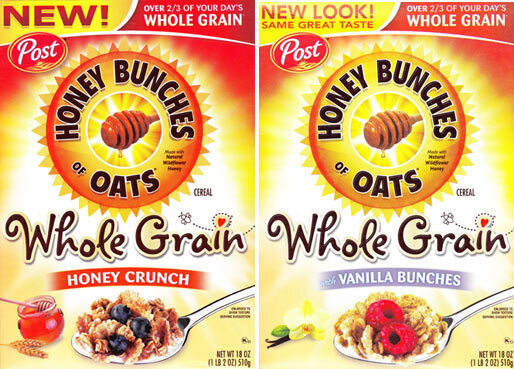 It should be noted that at the same time this cereal came out, Post rebranded their Honey Bunches Of Oats With Vanilla Bunches And Multi-Grain Flakes cereal as Honey Bunches of Oats Whole Grain With Vanilla Bunches. In the cereal aisle, it looks like that cereal and the one reviewed here are partner cereals with entirely similar packaging. Whatever they name it, the Vanilla Bunches cereal is also an excellent choice. Nutritional Considerations: Each 1 cup serving of Honey Crunch Honey Bunches of Oats Whole Grain has 220 calories, 3 grams total fat (0 grams saturated and 0 grams trans), 0 mg cholesterol, 150 mg sodium, 46 grams total carbs, 4 grams dietary fiber, 12 grams sugar and 4 grams protein. The $0.00 price below indicates that the company sent us samples of this product to be reviewed. What do you think of Honey Crunch Honey Bunches of Oats? Love it. Filling and good for me too.